For those thirsty for a new path toward real peace for the world, Perspective represents one man’s hopeful viewpoint. 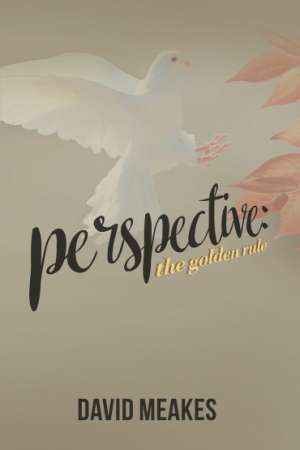 Perspective: The Golden Rule by David Meakes is a personal and historical look at that most elusive idea: world peace. Meakes is a veteran of World War II, and his five years of military service gave him a deep contempt for war, its bloodshed, and its futility. That experience, along with his early life and family, set him on a quest to find the way to a peaceful world. His journey of reflection and study leads him through religion and current events. The key, he determines, is as simple and complex as the Golden Rule: living it, teaching it, and developing worldwide unity beneath its umbrella. His suggestions for a better, more peaceful world—such as taking a global view of education—unabashedly acknowledge, and to some degree address, the roadblocks to their idealized visions, like the potential costs of such endeavors. The book’s balance of deeply personal and far-reaching thoughts and experiences is aptly maintained, but it’s not always possible for every reader to see themselves in every era or every topic. While that level of applicability is certainly not promised, the result is a desire to skip sections and get to the point. Those who commit themselves to walking with Meakes through his life and thoughts will find him and his ideas thought-provoking. To people hungry for the wisdom that comes with age and experience, and to those thirsty for a new path toward real peace for the world, Perspective represents one man’s hopeful viewpoint.